Black Hawaiian Sheep are the source of some controversy. Some say they are a cross of Mouflon and black hair sheep from the Hawaiian islands. 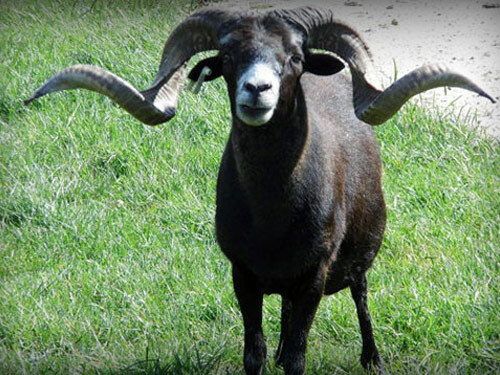 Others say they are Barbados sheep with a dilution of the red color gene making them black. They have a thick black coat and are usually black all over, although some sport a white muzzle. Like the other species of sheep of this type, their horns grow up, back, down, forward, up again, and then tip out. The horns of the Black Hawaiian are jet black. Males can weigh up to 140 to 150 pounds while females usually weigh about half that much. They are raise primarily for trophy hunting.